The Supplemental Nutrition Assistance Program (SNAP), formerly known as food stamps, has always been controversial. It's meant to help ensure that everyone gets enough to eat, and the program assures applicants that they have the right to be treated with "dignity, consideration, and respect." Yet, the program also imposes lots of complicated rules on users, and many people have shared opinions about whether users are making "acceptable" choices with their SNAP dollars. Recently, SNAP has been in the news — and in the middle of countless social media debates — because of three developments. First, Amazon opened its first automated grocery store, Amazon Go, where you can simply enter the store on the app, take the items you need, and leave without checking out as part of their Just Walk Out shopping experience. However, it doesn't accept SNAP. Second, a petition has been circulating advocating that SNAP benefits should cover food for pets as well as human household members. And third, the Trump administration Office of Management and budget director, Mick Mulvaney, proposed replacing food aid to low-income families with a "Blue Apron-style" box of canned goods and other non-perishables. Which made us wonder what you can currently buy with SNAP, and what you can't. SNAP and its beneficiaries have plenty of critics, often people who feel that low-income individuals should be limited in what they are allowed to purchase with public funds. Critics of those critics would say that prescribing their shopping lists is intrusive. Generally, the rules limit SNAP purchases to food products, with some limitations and exceptions. Energy drinks such as Red Bull have been available for purchase with food stamps since 2013, when companies making them began changing their labels to list "nutrition facts" instead of "supplement facts." Critics have tried to have them removed from eligibility, but as long as they are classified as a food item, they are likely to stay. Since they are clearly food items, you can, in theory, buy steak, lobster, shrimp, or any other high-end food with food stamps. Legislators have proposed removing such items from the program, but in reality there is no need: Data from the Bureau of Labor Statistics shows that people in the income group low enough to qualify for SNAP hardly buy any beef or seafood (only about 10 percent of the average monthly grocery bill), because it's too expensive. There is some truth to the impression that a lot of SNAP recipients buy junk food. A 2011 USDA analysis found that 23 cents of every SNAP dollar goes to sweetened beverages, desserts, salty snacks, candy, and sugar. (The other 77 cents goes toward meal ingredients, such as milk, bread, meat, cereal, and vegetables.) However, non-SNAP households spent 20 cents of every dollar on those same sweet treats. So shopping habits were similar, regardless of payment method. Nutritionists have expressed concern about the amount of junk food purchases funded by SNAP, which is meant to improve health, not to contribute to health problems such as obesity. But attempts to cut junk food from SNAP run into problems both with complexity and with the discomfort of making the government the judge of which foods are worthy and which aren't. Another approach, presented in a 2016 paper in the American Journal of Preventive Medicine, would be to provide incentives for purchasing healthy foods, either alone or in combination with limits on junk food purchases. While you can't buy hot prepared food items, you can buy baked goods. Muffins, cakes, and cookies purchased at grocery stores and some bakeries are fair game. Since they are technically edible, you can buy your Halloween pumpkins with SNAP — but not decorative gourds. Gift baskets, prefilled stockings or prefilled Easter baskets can be purchased as well, but only if at least 50 percent of the contents are edible items and the basket contains no prohibited items. For example, you could buy a holiday stocking with a few small toys and a lot of candy, but not a large stuffed bear holding a small box of chocolate. You can purchase coffee to make at home, in any form, with your SNAP card. This includes single-use pods such as K-Cups, instant coffee, cappuccino mix, whole bean, or fresh ground coffee. The vast majority of SNAP recipients are limited to buying groceries with SNAP. But in some states, elderly, disabled, and homeless SNAP recipients can participate in the Restaurant Meals Program. In Arizona, participating restaurants include Taco Bell, Denny's, Subway, and others. In 2014, SNAP began allowing participants to purchase seeds and plants that produce food, and launched a site to encourage gardening. You can legally buy fresh fruits and veggies, as well as homemade jams and honey, at farmers markets. The only catch is that most stands only accept cash, while SNAP functions as a debit card. The government is working with local markets to change that, including publishing a directory of farmers markets that accept SNAP and setting up incentive programs such as bonuses for SNAP users. While you cannot use SNAP for alcohol, you can buy mocktails, bloody mary mix, tonic water, or margarita mix. Despite the fact that we just listed a wide range of items that you can buy, there are actually plenty of things you are not allowed to purchase with SNAP benefits. Some make perfect sense; there's no way taxpayers are going to fund cigarette or alcohol purchases. But there are valid arguments that some of the following items should be covered. Those hot roasted chickens in the deli are sometimes cheaper, pound for pound, than raw chicken. And for people who don't have access to a kitchen, they could be included in many healthy meals such as chicken tacos or chicken salad. However, most SNAP recipients can't purchase any hot prepared foods, including these. 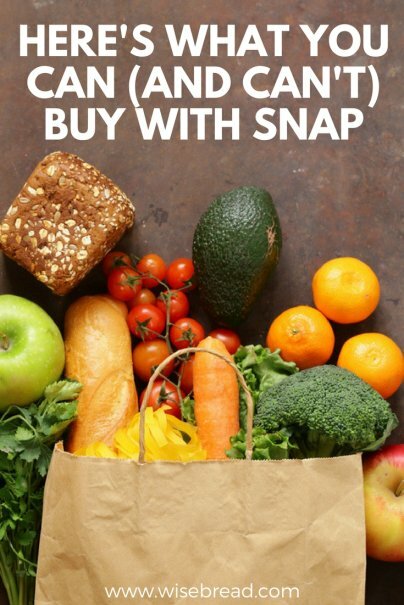 Since they are not food, you can't use SNAP to buy household items such as soap, laundry detergent, diapers, sanitary napkins, or toilet paper. Since these items are essential, this restriction can be a hardship for SNAP recipients. As mentioned above, a petition asking the federal government to include pet food in the SNAP program recently received more than 230,000 signatures. While there's a valid argument to be made that pet ownership is a luxury that the American taxpayer shouldn't have to support, the counterargument is that pet owners that fall into poverty are more likely to give up or abandon pets if they can't feed them — and housing these pets in shelters or euthanizing them costs the public money. More and more local governments are discouraging waste by requiring stores to charge for grocery bags. SNAP cannot be used to pay those fees, and the local law may not exempt SNAP users. So SNAP users should either bring their own bags or be prepared to pay for disposable bags with cash. SNAP users participating in the trial of online grocery ordering must pay any delivery or convenience fees in cash. While you could buy live crabs to cook at home, you can't use your SNAP card to buy a piglet to raise or a cow to milk — even if it would save you money and provide more nutritious food in the long run. Livestock just isn't part of the program. Alcohol and cigarettes aren't food, they're not nutritious, and the public doesn't want to pay for them.